TUCSON, Ariz. – After a wet winter and mild spring, Arizona has seen an increase in many wildlife populations. As summer approaches and dry conditions return statewide, several animals are instinctively moving closer to easy sources of food and water: wherever humans can be found. 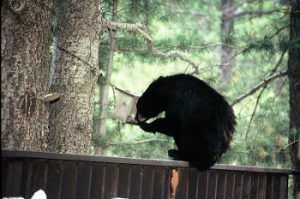 This has led to increased reports of bears, coyotes, mountain lions, bobcats and other wildlife in populated areas across the state, where lawns are watered, swimming pools are full, garbage cans are overflowing and dishes of pet food are left on back porches. This month, bears have been spotted in Tucson, Rio Rico, Patagonia, Payson, Flagstaff and at campgrounds along the Mogollon Rim. Mountain lions are being spotted in suburban neighborhoods, foxes have bitten two people and coyotes, as usual, are seen almost everywhere. AZGFD will sometimes relocate wildlife that make it into town, but about 50 percent of relocated bears often return to the spot where they were first captured. A bear found in Tucson this week was captured in Greer in July 2016 and relocated to an area outside Globe. It was found last week peering into a cabin on Mt. Lemmon before moving into the Catalina Foothills and needed to be dispatched. A necropsy showed the bear’s stomach contained pet food and garbage, indicating it was accustomed to feeding on trash and was lost its fear of humans. While there have been no confirmed mountain lion attacks on humans this year, a dozen lion sightings have been reported in southern Arizona and several pets have been attacked by unknown wildlife in Fountain Hills and Scottsdale. AZGFD also receives regular reports of coyote and bobcat activity in both urban and suburban areas. If you come across a lion, bear or coyote, AZGFD advises you not to run. Make yourself look as big as possible, make lots of noise, throw things and back away slowly. If attacked, fight back by kicking, punching or hitting the animal with a rock or stick. It’s important to report nuisance wildlife because aggressive wildlife that breezes through your yard may attack a neighbor’s pet or a child. If you see wildlife in places where they don’t belong or acting strangely, call the Arizona Game and Fish Department’s 24-hour Radio Room at 623-236-7201. “We hope people will follow these simple rules to help discourage wildlife from getting into trouble,” said Hart.